BELLEVUE, WA--(Marketwired - Dec 14, 2016) - Esterline Corporation (www.esterline.com) (NYSE: ESL), a leading global specialty manufacturer primarily serving the aerospace and defense markets, has announced the selection of Pierre Rossignol to serve as President for the company's Advanced Sensors group of companies, comprised of five manufacturing and aftermarket facilities employing approximately 1000 people in France, Mexico, Singapore, the United Kingdom, and the United States. Esterline CEO Curtis Reusser said, "It's a great pleasure to welcome Pierre to our Advanced Sensors team. His industry and international experience will be of great value to our business, particularly as we continue the improvements we've made both in our aftermarket penetration and in our overall strength as a top sensor solutions provider." 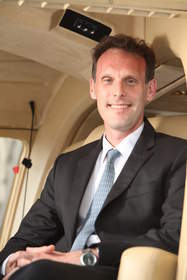 Rossignol joins Esterline after 14 years with Airbus Helicopters, where he was responsible for various programs and most recently led the Malaysian operations for the company. Previous roles with Airbus focused on operational performance improvement and supply chain improvement. He has also worked as a Sales Director for Aircelle's engine nacelle business and began his career with a sensors business that is a subsidiary of Esterline. He holds an MBA from The American International University in London. Rossignol succeeds Charlie Johnston, who is retiring at the end of this year after a 40-year career in the aerospace industry.